"It's ironic that the United States was the most vocal in saying they didn't want the car, but the CR-Z still made its world debut at the Detroit motor show," — Honda CR-Z's chief engineer Tetsuo Iwamura. Ironic because, according to Automotive News, American Honda was adamant that Americans didn't want a sporty-ish hybrid. "In the American market, people equate hybrids with the Prius," Tetsuo Iwamura reportedly told Honda Japan shortly before the car was completed. "If the hybrid is sporty, it's going to confuse the customers and dealers." "Don't worry about the States, just keep developing it," Takanobu Ito, the president of Honda Japan reportedly told his engineers. Originally planned as an internal combustion-only car, Honda altered its development path in the direction of hybridization in an effort to give it appeal in America. The CR-Z has proved controversial since its Detroit debut, with only 122 HP, its 0-to-60 barely edges out the Prius at 9.7 seconds and the Honda's fuel economy lags far behind the Toyotas; 40/43 MPG compared to 51/48 for the larger, five-door mid-size Prius. We've taken particular exception to it being touted as the modern day replacement for the legendary CRX. "This is what the future of sports cars will be for Honda. We are not pursuing absolute maximum speed," said Norio Tomobe, the vehicle's chief engineer. 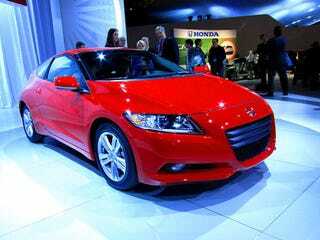 "The CR-Z is supposed to be an intelligent sports car."